The Somerton II wood burning convection stove from Mendip Stoves brings a level of contemporary sophistication not yet seen from the rest of the range. The extra tall slim line aspect and huge curved glass viewing area giving an unparalleled view of the fire while the insulated chamber and triple air supply ensure this wood burning stove is not all about looks. As with all wood burning or multi fuel stoves from Mendip Stoves the utmost attention has been paid to the smallest details to ensure that the stove you are purchasing is not only the at the forefront of efficient combustion techniques but is a pleasure to live with. The Somerton II includes pleasant features such as a cool touch handle and controls, integrated log store area and a preheated air wash helping to keep the glass clear giving you a clear view of the fire for longer. In addition the updated Somerton II model is available in three versions with the Standard version offering a log store area, the Pedestal offering added height for better viewing of the fire and the Compact being perfect for tighter spaces. 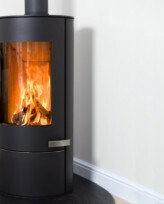 There is a Somerton II wood burning stove for every room.